You can't really call Tim Burton's film Alice in Wonderland for many reasons. One: it's not strictly speaking an adaptation of the Lewis Carroll books Alice's Adventures in Wonderland or Through The Looking Glass. Two: as many of the characters tell Alice, she really isn't in a place called Wonderland but actually called Underland. The film is therefore erroneously named. It also is more a facsimile of the books, a remarkably joyless affair that has only name recognition going for it. Alice (my not-so-secret love Mia Wasikowska) is now 19, and facing a most unhappy prospect of a proposal by the tweedy Lord Hamish Ascot (Tim Piggot-Smith). She does not want to marry him, but alas, this may be the only way to restore her family's fortunes. Instead, she leaves Hamish and everyone else watching them at her surprise engagement party to go chasing rabbits. Once again, she tumbles down a hole and finds herself in a world vaguely familiar but she stubbornly insists is all a dream. Here, Alice eventually finds the Mad Hatter (Johnny Depp) still in the middle of his tea party, but the world Alice enters is not a happy world. The Red Queen (Helena Bonham Carter) has usurped the throne thanks to the help of the Jabberwocky and pushed out her sister the White Queen (Anne Hathaway). The White Queen is looking for a champion to fight the Jabberwocky, and Alice, according to the scroll called the Oraculum (I figure because it's an oracle of things past, present, and future) states Alice and only Alice can kill this beast. Alice, of course, doesn't want to kill the Jabberwocky or anything really. She does feel an obligation to rescue the Mad Hatter, trapped in the Red Queen's castle. She does so, aided by the hunt dog Bayard (voice of Timothy Spall), the Dormouse (v.o. Barbara Windsor), and even the mischievous Cheshire Cat (v.o. Stephen Fry). Once rescued (being sure to take the Vorpal Sword with her), they are ready to take on the reign of terror of the Red Queen and her champion. Finally, she emerges back to her world and decides to do the most anti-Victorian thing and go into business, sailing to the East to swindle the Chinese, I mean, bring business to the Orient. Amazingly, in spite of its one hour and forty-eight minute running time, Alice In Wonderland feels far longer and both rushed and boring all at once. I put it to the fact that while screenwriter Linda Woolverton had a great source of material to work with, she and I figure Burton decided that the best thing to do was to take out all the wit, the joy, and the fun out of it and turn it into a cross between Return to Oz and The Messenger: The Story of Joan of Arc. The film is dark and dreary, and more blasphemous, there really is no story here. Other than the fact that she yells a lot and has a big head, we don't see the Red Queen as a new Gaddaffi. Other than her fluttering about we never see why the White Queen wishes to return to power. Even more peculiar, the Mad Hatter is actually rather sane, his hair notwithstanding. It takes a great deal of courage to take one of the Great Books of Literature (my English teacher always said the majority of quotations emerged from three sources: the Bible, Shakespeare, and Alice In Wonderland) and reduce it to a story of a somewhat stupid girl who has to lead some sort of revolution. I never trust a film that has a continous score, and longtime Burton collaborator Danny Elfman never lets up on his music. There might have been a minute or perhaps two where there was actual silence, but to my mind I believe having perpetual music in a movie is a sign that the film needs something to keep people interested or at least not drifting off to sleep. Granted, the sets and costumes are excellent in bringing us into this unreal (and allegedly named Underworld--side note: why change the name of the place, or better yet, why not call it Alice in Underworld) world, but besides that, what interest do we have in seeing Alice and her side defeat the Red Queen and her Knave (Cripin Glover) since we don't care about any of them. 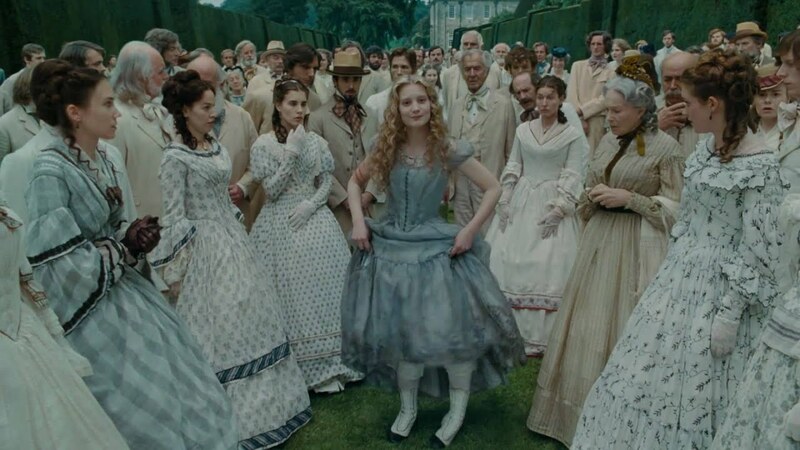 As much as Wasikowska enchants me in her films (The Kids Are All Right, Jane Eyre), she has also not (Defiance) and here, she is in the latter. Alice is so flat, having a blank expression through almost the whole film. I put it on the fact that there is no story to hold our interest. As stated earlier, Bonham Carter consists of yelling and Hathaway (who sadly given her makeup job looked 300 years old) was all fluttery. Now, I'll say that they played their parts correctly, but they never had any actual character traits that made us either fear/hate one or rally/care about the other. Depp doesn't go wrong playing oddballs but I'll say it again: the Mad Hatter isn't mad as in crazy; maybe mad as in angry. When he finally performs his Futterwacken (a dance of joy), it doesn't look funny or fun, just so at odds with the somber tone of Alice In Wonderland. The voice work is on the whole good. Alan Rickman was perfectly cast as the Caterpillar, and his grand tones, while easily recognizable, lent that air of haughtiness to the role. Windor's Dormouse is odd only in that it brought back memories of Reepicheep from the Chronicles of Narnia films. Whether it was a conscious decision to do so I don't know (I doubt it) but you can't have a mouse flinging a sword without us thinking about how similar they are. To his credit, I did not recognize Michael Sheen as the White Rabbit, though Stephen Fry was more recognizable as the Cheshire Cat (side note: given Sheen's best-known performance is as Tony Blair, wouldn't it have been more accurate to have had him play the Cheshire Cat). I will say that I did laugh when I heard the Cheshire Cat tell Alice that he never gets involved in politics. If only that were true. I bet a lot of the British-viewing public must have been rolling in the aisles or rolling their eyes. Yet I digress. The story itself doesn't make much sense: if all know Alice will fulfill 'the prophesy', why is everyone so clueless about what she is doing there? 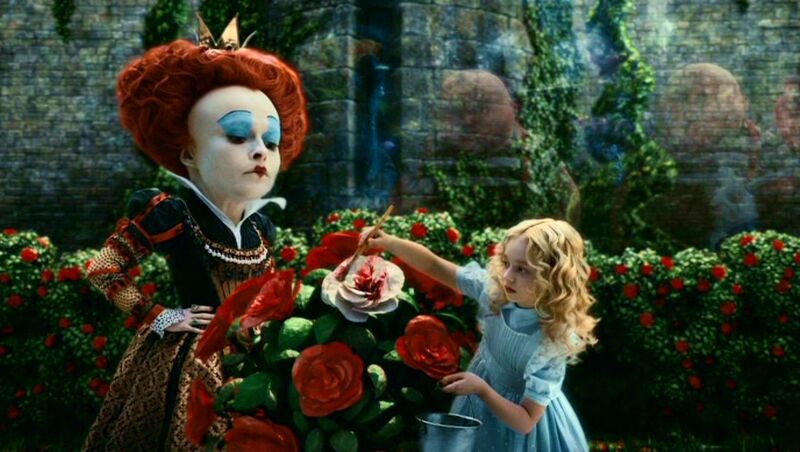 How is it that the Red Queen doesn't recognize Alice if she has seen her before in the past when she was there as a child, or even stop to think that this large creature who appears in her garden might be the mysterious Alice? I cannot get over the fact that all that is good about the two books the film is based on was sucked dry to create something that did not have any energy, any joy, or any originality. Alice In Wonderland is very busy but very empty, remarkably bland. 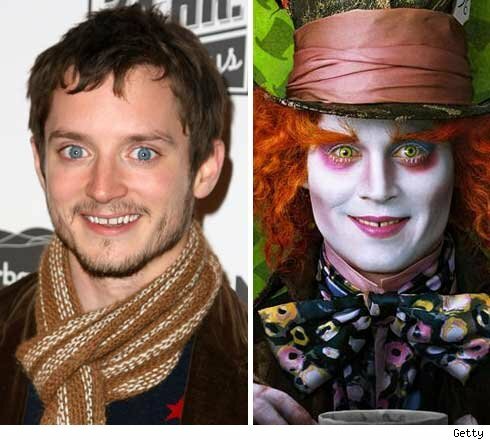 Even Johnny Depp suffers: his makeup makes him look like Elijah Wood of all people. As long-time readers know how I feel about 3-D, I need not waste your time going over that once more. Alice In Wonderland the 2010 film bears little resemblance to Alice In Wonderland the book. It was an interesting idea: to take a director known for his interest in the dark and quirky nature of life and adapt a work of joyful nonsense. Somehow, they didn't mesh. It's in the end odd that in Alice In Wonderland, there is no real sense of wonder, only boredom.